Build engagement and help prepare children to read and understand the message you are going to write by offering them some specific supports. Some supports you will want to offer include words and phrases that will appear in your writing. Review your weekly high frequency words and the vocabulary that you intentionally embedded in your writing piece. Explain the context for your writing. How did you come up with your idea? What decisions did you make as a writer when planning your piece? Importantly, let them know what you want them to learn. Ask them to think about or look for an element related to your primary literacy objective while you write. Supporting children in these ways will help in all areas of language development; listening, speaking, reading, and writing! High frequency words, or sight words, are words that often have very little meaning on their own (for example, “of”). Actually, they are often considered “service” words or connector words because they link words with more concrete meanings together. Pictures do not help you understand the meaning of sight words. (After all, what picture could you draw for the word “the”?) However, these words are important to the overall meaning of a sentence. While some high frequency words do follow regular phonetic rules (e.g. “he”) most of these words do not. Therefore, these irregularly spelled words must be must be memorized by your children. Take, for example, the word “have.” If this word followed the general phonetic rules for English, you would pronounce it with the long a sound and it would rhyme with “gave.” Therefore, children need to learn how to read and write these words with automaticity in order to build their reading and writing fluency. Additionally, English language learners’ ability to acquire sight words depends heavily on their oral language proficiency. If children do not have the word in their oral vocabulary, it will be more challenging for them to learn the sight word. Therefore, it is crucial that sight words are explicitly taught. How do you teach high frequency words? A good rule of thumb is to teach approximately three to five new words each week. You can select these words from the children’s writing (what high frequency words are they using and misspelling most often?) or from common high frequency word lists such as the Dolch List or the Fry List. Show and say the word. Use the word in context (i.e., in a sentence). Then, children should say the word, chant the letters of the word, and write the word on a piece of paper or on a wipe off board. Engage the children in saying and spelling the word through multisensory activities such as clapping each letter. There are many word wall chants, cheers, and games you can play with your children to bring these words to life. 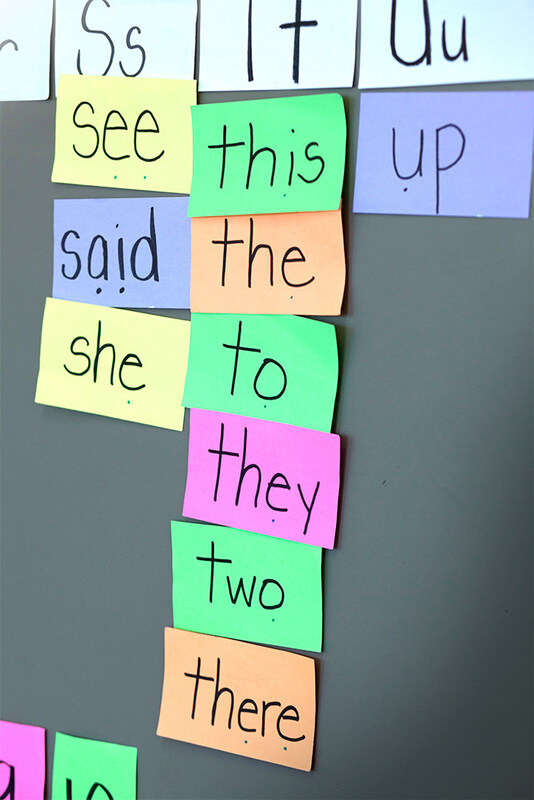 Quickly reinforce how to read and write these words during a transition activity (“Before you line up, hold up the number of letters in the word “they”). Or do a quick five minute review (“Let’s ‘write in the air’ this week’s word wall words”). Also, promote searching for and identifying sight words in context, mirroring how children authentically encounter the words. You can provide children with reading materials appropriate to their levels that can be written on, and ask them to circle/underline/highlight the sight words they find. Or, ask them to count how many times they notice certain sight words occurring in suggested texts. At the end of the week, hang your words on your word wall. There are several lists of high frequency words that you can refer to when choosing words to teach your children. The Dolch word list includes 220 of the most common English words encountered in children’s books. The Fry Words is a list of commonly used words in English ranked in order of frequency. The Davies List ranks Spanish words in order of frequency as well. Use what you know about children’s reading and writing needs to decide which words to teach. Refer to their writing and your anecdotal records to pinpoint exactly which words your children would benefit from learning. Use multisensory teaching strategies to present information in a way that engages visual, auditory, and tactile learners. For example, using chants to introduce and review high frequency words helps children see the words, hear how they are spelled and also use their hands and/or bodies to help commit these words to memory. Here are some examples of chants you can use to help children learn to read and spell high frequency words with automaticity before you write your message. Tip: Be sure to use a separate movement for the letters and the word in order to enhance children’s understanding of the difference between the two. To engage and involve your children, create a chart with the chants that you teach them so they can participate in selecting the ones they want to use each day. Message Time Plus is a wonderful instructional practice for exposing children to robust and academic vocabulary. When planning your message, embed one to three grade-appropriate literary and/or academic vocabulary words. Seeing and reading vocabulary in context will increase the likelihood that children will learn what they mean and use these words independently when they’re speaking and writing. When selecting vocabulary, include words that children will most likely encounter again and can attempt to use in conversation. Literary vocabulary are often called Tier II words. These are robust academic words that require instruction and are often found in high quality children’s literature. Examples of such words include: rambling, furious, and intrepid. Tier III words are content area words such as “photosynthesis” or “evaporation.” These are vocabulary words that are needed to discuss specific fields of study like mathematics, social studies, and biology. The vocabulary words you embed in your message are words you want to teach, preview, or review. They are always connected to other parts of your instructional day. 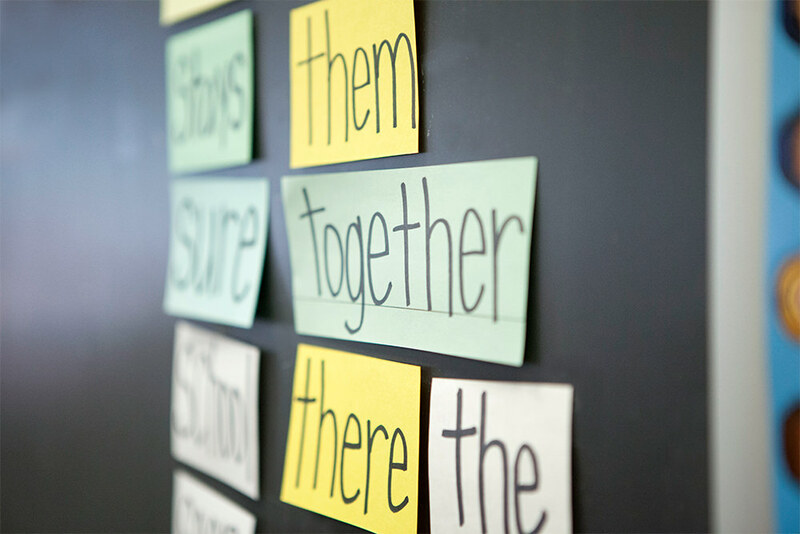 Use words connected to your read alouds. Use words from content areas (i.e., math, science, social studies). Use words that reflect the life of the classroom (i.e., responsibility, respect). Oftentimes, you support children’s decoding and comprehension before they read your piece by previewing these words. 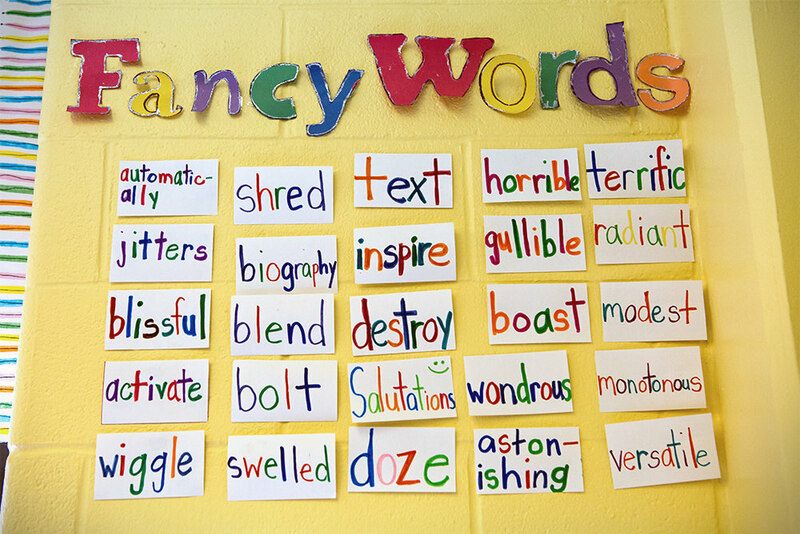 Offer children a child-friendly definition of the words and post them beside your board. Tip: Post vocabulary words in the same place each time you do MTP. For example, write them on index cards or sentence strips and post them on the right side of the board. One of the things that people do when they travel is keep a travel log, a sort of diary of events related to their travel. This helps them to remember things about the trip that they don’t want to forget. As I write today, I’m going to imagine that I’m the grandfather in the story, Grandfather’s Journey that we read earlier today. I’m going to create an entry in my travel log or diary. I’m also going to use similes to describe the images I want to remember. Similes will help me create better mental images by comparing one thing to another. See if my similes help create strong mental images for you as well. Tip: Keep in mind that your think aloud should leave room for children to problem solve. For example, don’t expose children to every challenging word that you will use in your message. These are amazing tips and tricks to teach a wide range of words or vocabulary to children. This article is very helpful for teachers and parents as well. Regards Brian Bissonnette.